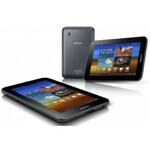 Yesterday, we let you know that Amazon had put up the Samsung Galaxy Tab 7.0 Plus for pre-order. Today, we have the official word from Samsung with dates for more widely available pre-orders as well as the release date for the 7.0 Plus. It seems that Amazon only broke the pre-order date by a few days. Samsung has said that the Galaxy Tab 7.0 Plus will be available for pre-order starting this Sunday October 23rd from select retailers. Then the Tab Plus will be released on November 13th, and will be available for purchase from Best Buy, Amazon, Tiger Direct, Fry’s and other retailers. The pricing we saw on Amazon was also correct. It will be $399 for the 16 GB and $499 for the 32 GB model. The Tab 7.0 Plus will also come with Peel pre-installed. We're not really sure how much value this adds, since Peel is available for free in the Android Market, but it could help you find TV shows to watch. Which version of the Tab Plus will be available? I read on Engadget that only the WIFI version would be available? And When a data version is released will it have the phone feature a part of it or will I still have to buy the unlocked version to use it as a phone?